P.F. Chang is a global dining restaurant chain that offers combined Chinese cuisine and American-style service for a contemporary casual dining experience. "P. F. Chang's" is the namesake of Paul Fleming (P. F.) and Philip Chiang (whose surname is simplified to Chang). In an interview, Chiang says “I was the food consultant, he was the operations. We didn't even write anything down. It was just a handshake." Their first P.F. Chang's opened in Scottsdale shopping mall—and took off with 1,000 customers the first weekend. After 20 years of success and expansion worldwide, P.F. Chang wants to expand their menu to include a wider diversity of Asian food and to incorporate many different Asian cuisines to the P.F. Chang culture. Today P.F. Chang is operated by Centerbridge Partners, but Philip Chiang, one of the co-founders, continued to work as culinary consultant with responsibilities for the current menu and new dish development. On October 14th 2014, Chiang made the honor to launch officially the sushi menu in Beirut City Center for all the P.F. Chang branches in Lebanon. P.F. Chang had started serving its Japanese menu from August, but it was not until a few days ago that I had the opportunity to taste it. “Sushi a la P.F. Chang’s” menu includes delicious Maki rolls as well as Sashimi and Tempura menu selections. The sushi is hand-made from fresh ingredients on order—it’s very important to mention that they are not actually premade and stored in the fridge. Mr. Chiang first greeted us all and took pictures with us. When I came in to the restaurant I was offered a choice of sake-based drinks and I picked the Sangria wine. 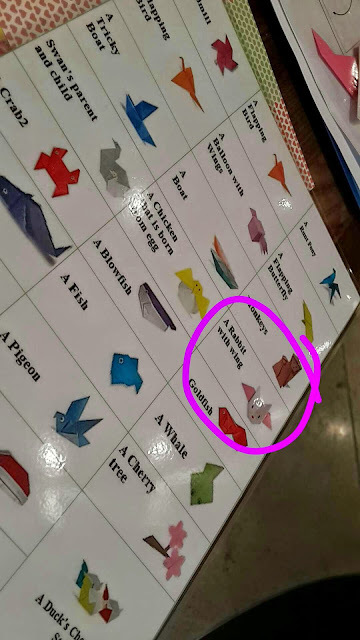 Then, I participated in a very entertaining activity before lunch, learning how to do origami! Don’t laugh for my choice; the one I picked was a flying rabbit! 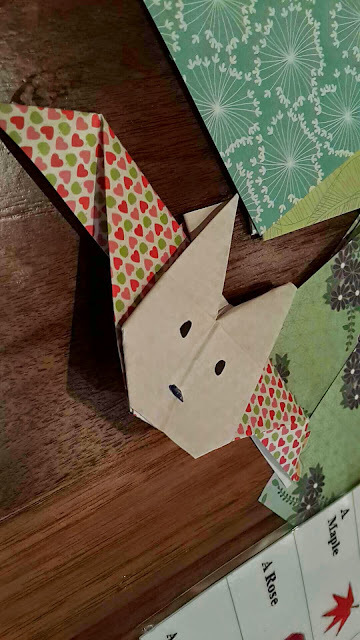 Well, it sounded cute but it was actually the hardest origami according to the Asian woman teaching me, and apparently, I could certainly do any origami after this one. YAYY so a round of applause please! After that, we sat around the U-shaped tables facing Mr Chiang, the global marketing rep and Mrs. Khalife who is probably a rep of the licensee of P.F. Chang in Lebanon. While we were eating, Chiang told us about P.F. Chang’s background and specialties. He also shared with us some insights for eating sushi. How about… how to eat the Maki? Chiang would barely tip his Maki in the Soy Sauce because to his taste, it’s too salty, also, you don’t want the rice to fall apart. He will usually have some ginger to change the taste of his mouth after every bite. First, we were served three kinds of Edamame as starters: Bland Edamame with salt, Spicy Edamame with Potsticker sauce and chili paste (that tasted a bit like the “Loubye bi Lahme” for the sauce”, green beans with a tomato mix recipe that we cook in Lebanon), and something I have never tasted like this before, Orange-Ginger Edamame. The round of starters continued with Tuna, Salmon, and Yellowtail sashimi followed by Tempura veggies and shrimps. I thought that the sashimi were sliced too thinly—they were so good with their dripping spicy sauce that you actually wanted more of it. 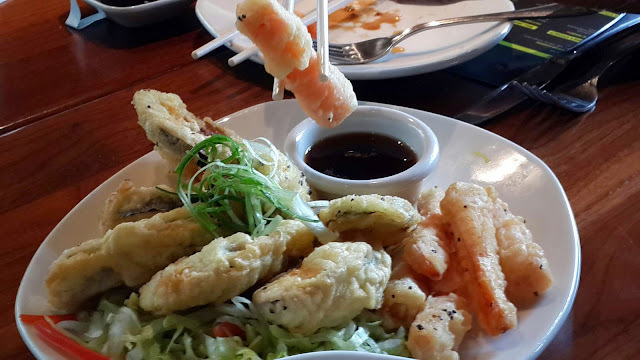 As for the tempura, the shrimps are not huge compared to the some places where I’ve already been but it’s a good portion size nonetheless. I loved both the eggplant and carrot tempura—one is moist on the inside and the other comes crunchy. The most interesting part of this culinary experience was the different rolls of Maki. I tried the dynamite roll, which I was the most excited for because it’s my favorite starter into a maki roll and I wasn’t deceived. I also tried the Crunchy Ebi (a shrimp tempura roll with P.F. Chang’s special dynamite sauce), the P.F. California which I thought was okay, the spicy Dragon (a mix of avocado cucumber topped with spicy tuna), the spicy salmon, the Sunshine and rainbow Maki, both with yellowtail fish. My favorite was the spicy salmon followed by the rainbow and dynamite maki. Before concluding with dessert, we all shared what we usually don’t—the dynamite shrimp. The dessert was different from the rest of the menu, basically it was more the American side of P.F. Chang, yet, it didn’t escape a far-eastern influence. I enjoyed “The great wall of chocolate” an immense six-layered chocolate cake topped with semi-sweet chocolate chips; the cake was a bit dry so I used much of the red berries sauce that complimented it well overall. As for the Banana spring rolls, it’s different. The first time I have tried it in P.F. Chang I didn’t like it at all, I thought what the hell a hot banana I’ve never eaten a hot banana before! But as for the second time, I think I liked it with the vanilla ice cream. Yes, it’s thumbs up. So there were a lot of new flavor blends I discovered, innovative combinations between ingredients you already know. I really think that’s what sets P.F. Chang apart from the other Japanese restaurants. You cannot have P.F. Chang sushi elsewhere, but you can surely have sushi anywhere. Yes, it sounds like great marketing but I really think this very, very, seriously. No Lebanese guy has the guts, the expertise, and the credibility to experiment and succeed with innovative sushi like P.F. Chang’s. So it’s nice to have some different sushi around town. Btw you can find some of their chinese recipes online, (here), if you love cooking like I do, or, just any interest in trying out something new.